You’ll always come across branches that won’t get out the way. They keep growing and blocking the view of other plants in the garden. Well, there are several tools you can get such as the kukri, and the pruning saw, but none can match the effectiveness of a lopper. Gifting yourself with the best pruning loppers should be among your gardening goals. Read our guide below. Loppers can be categorized according to the cutting mechanism and the blade type. The traditional varieties do not have an assisting mechanism. You use muscle strength to close the branch and cut. However, ratcheting loppers are quite comfortable as they utilize pressure to cut the branches. These are ideal for those that don’t want to do the hard work or whose hands are weak. The compound action loppers work in the same way as ratcheting by exerting additional pressure. They have a pivot point and a special lever. On the basis of blade styles, we have anvil and bypass loppers. The bypass style is quite popular and has a scissor-like design. It has a fixed lower jaw, and the upper one slides past it when in action. Bypass loppers give a clean cut from which the plants heal very fast. Make sure the bolts on them are tight to prevent jamming in case something gets trapped in between the blades. For the anvil loppers, we have an upper cutting jaw and the lower one for support – the anvil. Anvil loppers are not as effective as bypass loppers. They can lead to crushing and so are not the best for the plants at the back of your yard. Of course, there are quite a significant number of loppers out there, and that may be confusing for gardeners trying to find a foothold – well, even the pros. There’s just too much chest thumping marketing that can easily mislead. However, knowing what makes a lopper a good lopper is the first step to nailing the right product for you. The effectiveness of the lopper is not only down to the blade, but also the handles. The real force is applied to the grips, and so it is imperative they are durable and as comfortable as possible. There is no use having a pretty sharp lopper, but the handles are unkind to your hands. The sharpness would not matter. Handles graced with rubber or foam are pleasant to hold and use. They should also demonstrate a high level of strength to resist bending or even breaking – you know how frustrating this can be. Good handle materials include reinforced aluminum, steel, and titanium. A flat lopper blade will produce unsightly results and will leave your hands screaming. When you go shopping be on the lookout for loppers with a “stay sharp” quality. The blade should also have a coating protecting the blade from rusting and providing a smooth glide. An efficient blade has no nasty kickbacks. You will find different loppers on the market with varying handle lengths. There is nothing wrong with choosing the short handle versions. However, not all trees have low lying branches. The majority of trees tend to soar above our head to a point where we cannot reach them standing. In such a case, the short loppers will have little to do. The long arm loppers or those that come with an extension are desirable. They afford you a decent reach, and no pesky branch would get away from you. However, make sure they are not too long to lose the power of force. A tool with a good spring back makes your cutting task so much easier – almost fun. The feature ensures that the blades are in an open mouth position so that your only action is to apply force to cut the branch. You won’t need to keep prying the handles open every time you nip a branch. Therefore, make sure the lopper you choose has a good spring back so that cutting tasks are more manageable. Any tool that you will be holding above your head should not be too heavy. It should be easy to bear so that you can complete your task without much hassle. Good loppers should weigh about 3lbs. With that said, however, be wary of the cheap stuff in the market which can make the loppers very light such as the hollow aluminum. Check the specs very carefully and make sure the material is solid aluminum or other suitable quality metal. This is a compound action lopper meaning that it makes it easy to cut branches. It is ideal for dry undergrowth. The lopper comes with carbon steel blades that remain sharp even after repeated use. They are also coated for low friction making it a joy to use – this is great for people with relatively weak hands. This coating also prevents rusting and so the blade may endure the test of time. Bypass loppers make quick and clean cuts that the plants can rapidly heal from. This means that chances of infection are quite minimal. The lopper can easily cut through 1.25” thick branches with so much ease – makes it seem so effortless. And to enhance your comfort when using, the device has rubberized grips and shock absorbing bumpers. 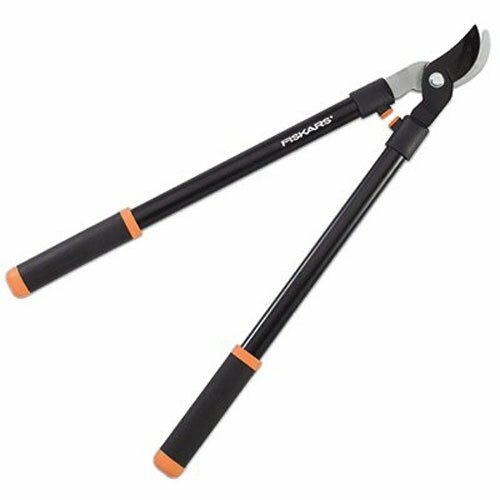 Fiskars is one manufacturer known for making quality gardening equipment, and this bypass lopper is adequate proof. For starters, the lopper is quite sharp and ideal for dealing with living plants. The blade is fully hardened, and so it stays sharp for a pretty long time. It has a unique coating that keeps rusting and problematic friction at bay. The tree sap and other matter do not have a chance of sticking. Its handles have a decent 22 inches length for easy reach of overhead branches. For those far away branches, you will need something long to reach them. As a matter of fact, this lopper has a good length to reach those pesky branches that have been blocking your morning view. The blade is fully hardened for durability – you may also have the sharp blade for long. This 1.5″ cutting capacity lopper comes with a special coating to prevent rusting and hassle-free usage – no friction. 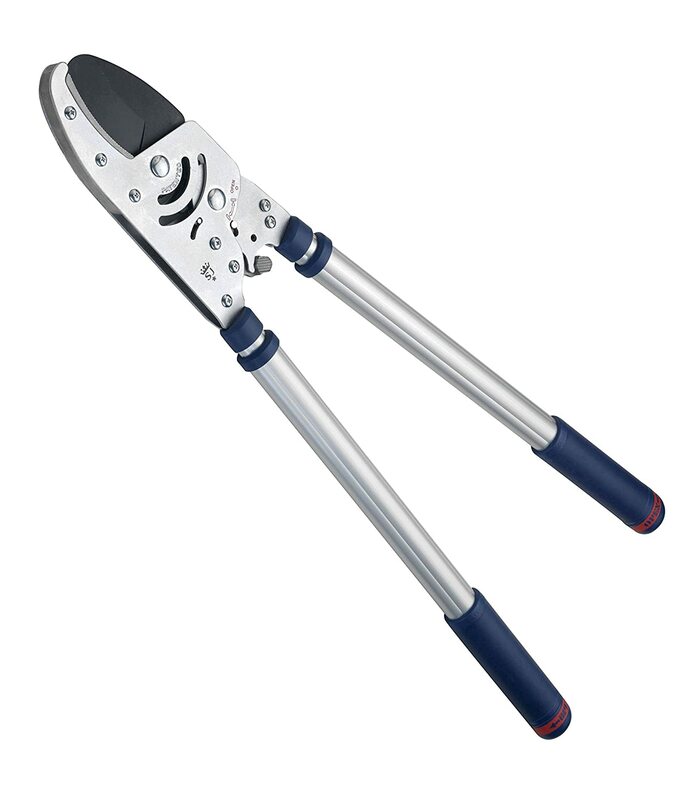 This may be your ideal thick branch cutter as it has a powerful ratchet action mechanism. The upper cutting blade is carbon steel for durability and keeps the sharpness for longer. And to prevent rusting, the blade is coated with Ptfe. The handles are tubular aluminum making them pretty light. Loppers are quite a functional tool to have around especially if you are a gardener. 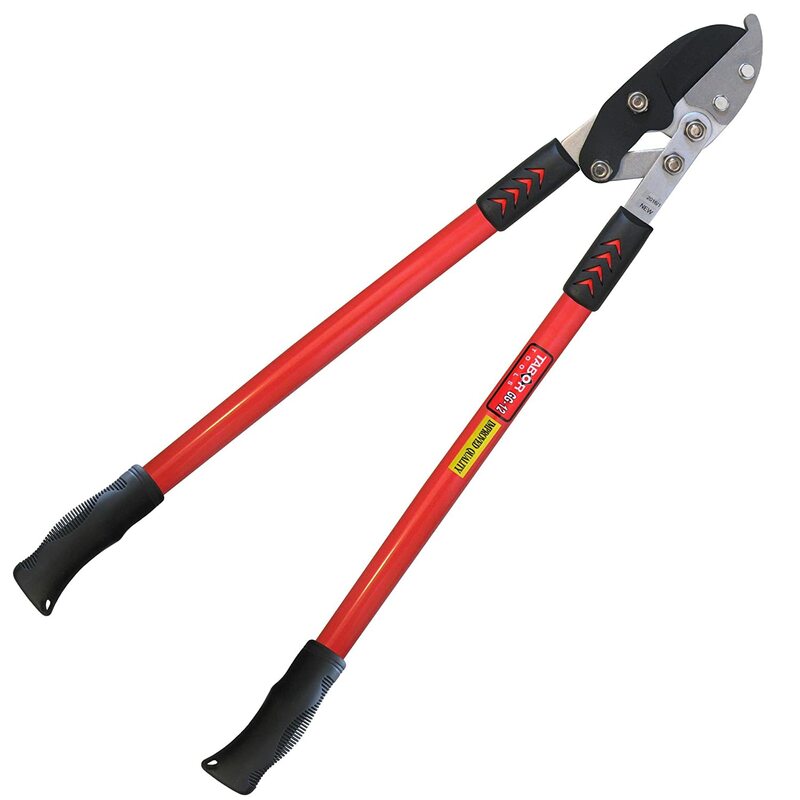 The best loppers make cutting pesky branches and light pruning of far to reach branches quite easy. This list includes some of the best loppers you will find out there, but our choice is the Tabor Tools GG12 Compound Action Anvil Lopper. This compound action lopper makes it easy to cut branches. It has a carbon steel blade coated with a unique substance for rust and friction resistance. 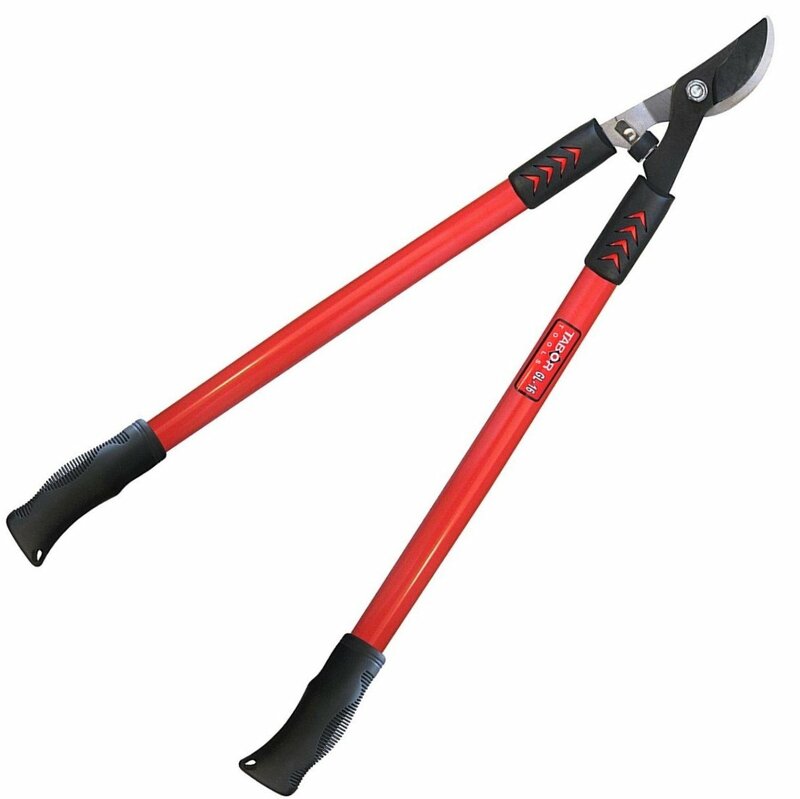 With this loppers, you may have a say over how long branches reach in your yard.